gold-filled spacers closed by a gold-filled toggle and loop clasp. filled toggle and loop clasp. 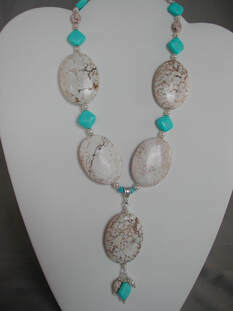 20" necklace featuring Magnesite (white turquoise) large and small ovals and round beads, (blue) turquoise beads, white freshwater pearls, silver plated findings and a pewter toggle clasp. Complementary earrings (not shown) have the same small ovals, turquoise beads and white pearls and hang from sterling silver hooks. Necklace and earring set: 20.5" - 23" adjustable length necklace featuring Chinese turquoise discs and balls, gold-filled cones and findings. The Chinese turquoise pendant is 3" itself and hangs 4.5" from the cones on gold-toned wire. 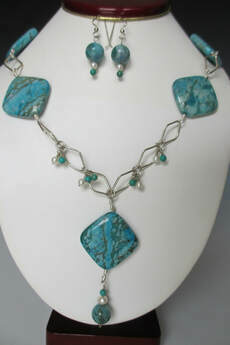 Necklace and earring set: 26" necklace featuring Ocean and chalk turquoise stones. The drop portion is removable at the clasp and is 5" long. The findings are pewter and the chain is sterling silver.